It’s National Park Week! You can visit any one of America’s National Parks for free April 16-24. Yes, that is technically more than a week, but I won’t tell if you won’t. The extension of the definition of “week” allows for all of us to take advantage of two weekends of admission free national parking. This year is particularly special because the National Park Service is celebrating its 100th anniversary. The NPS officially turns 100 on August 25th, but such a significant milestone deserves a year long celebration, don’t you think? It’s hard for me to pick a favorite national park, every one that I have visited has left an impression. Using frequency of my visits as a gauge of favoritism, Grand Teton National Park, Canyonlands National Park and the little gem tucked away in my backyard, the Buffalo National River would be my top three (not necessarily in that order). Each is so different and so beautiful in their own ways. The Buffalo is my park. I can’t begin to count the number of times that I have visited. It is the preferred canoe camping destination for me and the ragtag group of river rats I call friends. It’s an easy float, mostly class 1 (light riffles) and an occasional class 2 (medium-quick moving water) rapid in the upper stretch of the river after a good rain. The scenery is stunning. Towering limestone bluffs border the milky green water, with the tallest, Big Bluff, standing more than 500 feet above the water. The river has some of the best gravel bar camping I’ve seen, and since a lot of Buffalo floaters are day trippers, you have the place practically to yourself after the outfitters’ afternoon pick-ups are complete. It is a primo canoe camping experience, but if you prefer the comforts of car camping, pit (or even flush) toilets and potable drinking water nearby, NPS campgrounds accompany most of the river’s access points. While I spend most of my time on the Buffalo canoeing, hiking is also a popular activity. The National Park encompasses more than 95,000 square acres around the river and some of Arkansas’ most breathtaking views can be found along Buffalo River hiking trails. The Buffalo River Trail spans 37 miles of wilderness area. It’s popular for both backpackers and day hikers. In the springtime, or after a significant rainfall, a hike into Hemmed-In Hollow is a favorite. It can be accessed from the top at Compton Trailhead or from river level. The reward is standing in the presence of the tallest waterfall between the Rocky Mountains and the Appalachians. Another very rewarding view is earned by those who venture onto the Goat Trail. I first hiked this trail awhile back on a bit of a whim. It was early in March and the Ozarks was experiencing some exceptional early spring weather. In need of an outdoor getaway, I called my friend Pam to see if she might be available for an impromptu trip to the Buffalo. Indeed, she was. I promptly booked a cabin for us and the next day, we headed south. 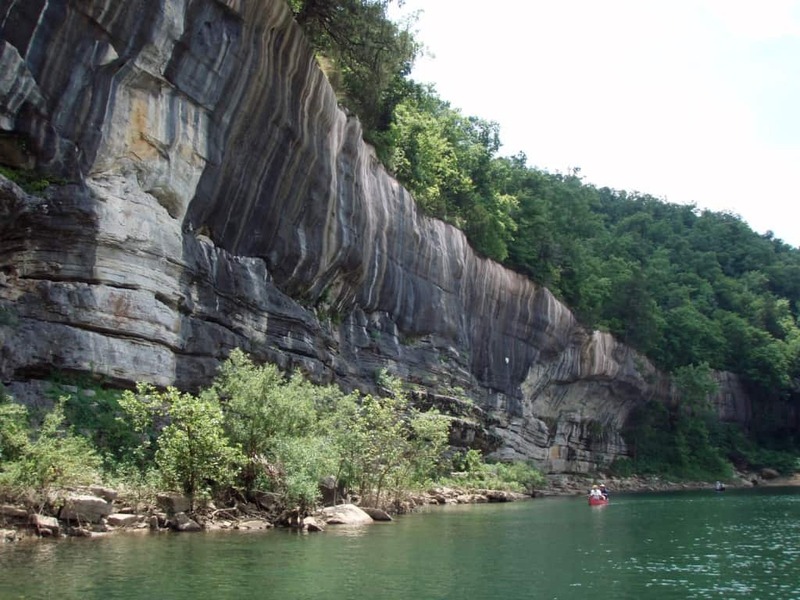 I rode shotgun on the way down, reading passages out of Kenneth Smith’s Buffalo River Handbook, and as we worked our way through the options, it was clear. We were going to hike the Goat Trail. The Goat Trail is a spur off of Centerpoint Trail. It is not for the faint of heart or those with a fear of heights. 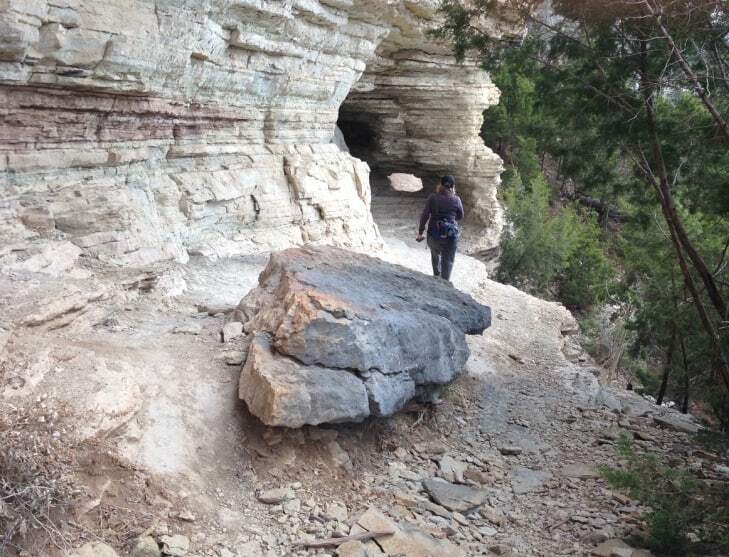 The trail follows a narrow ledge along Big Bluff, 350 feet above the river. As we learned from reading the Buffalo River Handbook, the trail has a fascinating history. Do you see the hole in the bluff? It was hand carved by concerned parents back in the early 1900’s when their little darlings had to use the Goat Trail to get to school. Among other things, children of settlers on the far end of the trail used the trail as their route to school on the other side, near the Centerpoint Trailhead. 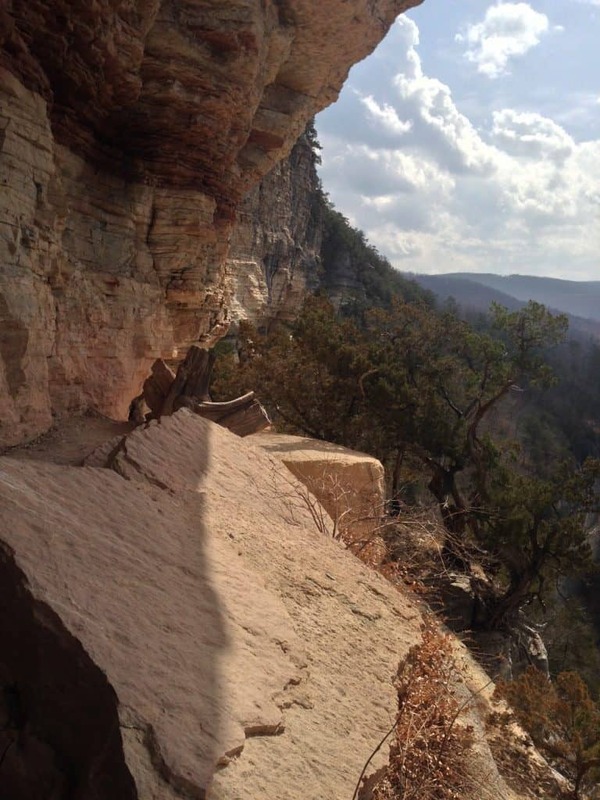 Their parents, rightfully concerned by the potential risks of the trail, hand-carved a hole in the bluff at one of the trail’s most narrow points, so that their children might have a slightly less dangerous path to school. We had beautiful weather, albeit a bit windy, and enjoyed some breathtaking views. We decided to extend our hike when we came off the Goat Trail spur by heading a few more miles down the trail to Granny’s Cabin, one of the last homesteads on the Buffalo River. The way back to Centerpoint Trailhead was all uphill. When we got back to the cabin at Lost Valley we were exhausted, but had a great sense of accomplishment. We had a happy hour snack and enjoyed a glass of wine in the cabin’s hot tub as we mulled over our day’s adventure. Dinner was grilled steaks, baked sweet potatoes and salad. And though we had big plans of playing guitar around the fireplace with another glass of wine before turning in, the pillows were calling our names. We crashed early, slept well and woke up with a great memory of a fun day spent in the woods. Interested in your own adventure on the Goat Trail? This news segment from Arkansas television station KFSM will give you a good idea of what to expect.